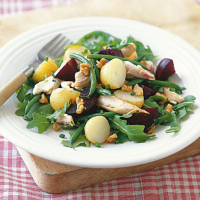 Freshly-cooked beetroot adds colour and flavour to this salad with ready-cooked chicken. Serve with crusty bread for a light lunch or supper. Cook the beetroot in a medium-sized pan of boiling water for 20-25 minutes, or until tender when pierced with a sharp knife. Drain and leave to cool. Meanwhile, cook the potatoes in a large pan of simmering water for 15-20 minutes, or until tender. Just before they are ready, add the green beans and allow them to simmer for 2-3 minutes, or until the beans are just cooked. Thoroughly drain the potatoes and beans and return to the pan. Add the lemon juice, oil, most of the chives - reserving a few as a garnish - and season to taste. Stir in the chicken. Divide the roquette between 4 wide, shallow bowls or scatter across a large serving platter. Using a small, sharp knife or your fingers, remove the skins from the beetroot then trim and cut them into bite-sized pieces. Add to the pan with the potatoes and chicken, and gently tumble through. Pile the salad over the roquette, scatter with the remaining chives and the walnut pieces, and serve immediately. Alternatively, use a 250g pack of ready-cooked beetroot, heated according to pack instructions. Cooked beetroot can stain skin and work surfaces; wear thin disposable rubber gloves to peel them. A versatile dry southern French rosé would work well here.